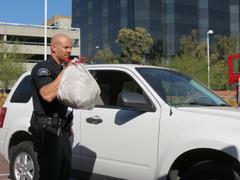 Drug Take Back Event @ BPD - Saturday , April 26 from 10:00 A.M.-2:00 P.M.
On April 26, from 10:00 a.m. to 2:00 p.m., the Burbank Police Department and the Drug Enforcement Administration (DEA) will give the public its eighth opportunity in three years to prevent medication abuse and theft by ridding their homes of potentially dangerous, expired, unused, and unwanted prescription drugs. Last October, Americans turned in 324 tons (over 647,000 pounds) of prescription drugs at over 4,114 sites operated by the DEA and state/local law enforcement partners. This initiative addresses a vital public safety and public health issue. Medicines that languish in home cabinets are highly susceptible to diversion, misuse, and abuse. Rates of prescription drug abuse in the U.S. are alarmingly high, as are the number of accidental poisonings and overdoses due to these drugs. Studies show that a majority of abused prescription drugs are obtained from family and friends, including from the home medicine cabinet. The public can find a nearby collection site by visiting www.dea.gov and clicking the “Got Drugs?” banner, which links to a database where they can enter their zip code. 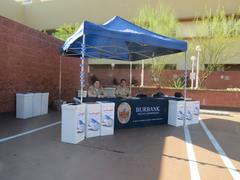 The Burbank Police station will have a collection container available from 10:00 a.m. until 2:00 p.m., on Saturday, April 26, 2014, in the parking lot to the rear of the station (200 N. Third St.).